To engage a girl in a chat, real-life or online, you’ll have much greater success if you know how to pull off an icebreaker. Icebreaker can be anything that breaks the ice or the nervous silence when two people meet for the first time. If you belong to those that have mastered this craft, perhaps we can get a few lessons from you. Instead of letting people fall for the tricks of WetHunt.com that misuses the icebreakers as some special way of help for users, tell us how you do it in real life in the comments. But, for those that don’t feel like they know how to behave around girls, offering a nice an easy way to land a casual date is welcome. The scamming methods used by WetHunt.com are well elaborated in their Terms $ Conditions. But, wait a minute – who reads the T&C? Almost no one and that’s the biggest problem with fake dating sites. The site mentions the staff profiles and the icebreakers in these documents. Luckily, we were cautious enough to read them for our readers. Call them customers service representatives or call them staff profiles, they perform one and the same function on WetHunt.com. It’s almost impossible to avoid them because they show up on the screen instantly – just after you complete the registration. it makes you wonder how these girls had the time to discover your profile and send you a message. There is a simple answer to that – because they are generated by computers with fake photos and have nothing to do with real women! As the site says, they have the objective of engaging you on the site and helping you get laid as soon as possible. But the only thing you’re going to get with these staff profiles is a huge bank statement balance. We get to the information presented in the introduction: the icebreakers. This is just a fancy name for computer-generated content. Such messages seem to be sent by the staff profiles, delivering an impression that the site is bursting with activity. Now, if you are a true newbie, you may fall for the scam, but the staff profiles and the icebreakers on WetHunt.com are so poorly executed that it immediately becomes obvious that they won’t get you any real dates. For instance, let’s look at this signup screen. Without a profile photo, seconds after registration, the screen gets filled with chat requests that look so false that a dog could tell they are not genuine! These poorly created popup notifications are yet another proof that you won’t find any casual hookups on this service. If you need additional persuasion after those pretty transparent T&C, you are welcome to test your luck and share your experience. There are claims that the staff profiles aks for money just to meet – stay aware! 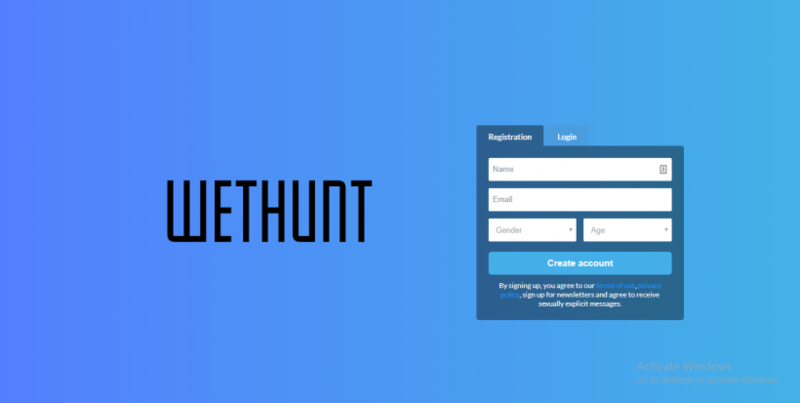 WetHunt.com is an illegitimate dating service, which, though it’s pretty transparent, it’s still succeeding in attracting new users to register and risk getting huge fees on their bank statements. It’s really not worth spending your time or your money on this fraudulent website.